« Just another tourist in Rome? 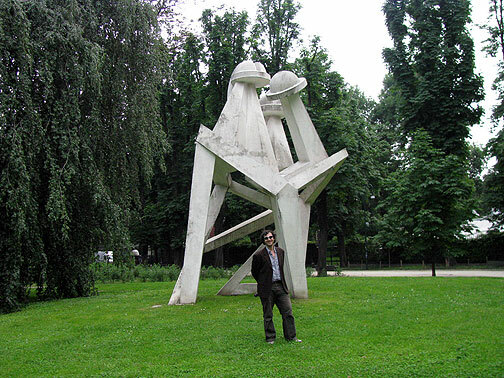 Had a really great visit to Milan, spending three days wandering around the center of the city and its parks, mostly with my good friend Giovanni M., but also having a chance to catch up with Pesce, Alex F., and even got a couple of fun hours hanging with a new friend, a Norwegian third generation radical peasant named Gunn. She and I are separated by a lot of years but we found a common language around our mutual interest in radical politics, mental health, the web of life, and more. I had a fruitful meeting with old publishing friends who are interested in an abridged version of Nowtopia, but there are still some more options to consider before I commit finally to that plan. Between them, and many of the people I met and stories I heard, the striking thing here in Italy after about a week is how far the institutional left has fallen. The big communist union is still a force, but after the recent election that returned Berlusconi to power, all the smaller parties of left and right that stayed out of the big parties of center-left and “center-right” failed to gain enough votes to return to parliament. Thus, as Giovanni said with equal parts amazement and satisfaction about those former perpetual politicians, “they’ll have to get a job!” It’s also likely that the demise of representation for many of these smaller parties will mean their disappearance in the next year or two from the streets since there will be no state money to keep their newspapers printing or their offices rented. In a way it seems curiously analogous to the U.S. where representative democracy is a hollowed out phenomenon that essentially pits competing advertising campaigns against each other in lieu of any meaningful political debate. The imminent demise of the institutional left here matches the long decline of the unions and the increasingly chimerical nature of political parties in the U.S.
All this is to say that it’s a lot easier to find space when there aren’t major institutional players and their preponderant ideologies crushing all attempts to reinvent politics or rethink old assumptions. It also means that resources will be a lot scarcer and the kinds of DIY efforts that I write about in Nowtopia might become more crucial and foundational to future political action. Pretty speculative at this point, but I noticed in talks with various friends that Nowtopian thinking is quite welcome here, and generated some real excitement among people who are struggling with this new political landscape. Not to say that I’m offering a formulaic approach, or that people’s responses to me or my book indicate anything at all about deeper trends or bigger political questions, since it’s ridiculous to claim such importance. But it has been satisfying and very exciting at moments to feel like I’ve hit a vein and might be providing some timely information and analysis. Of course I had my camera with me as I wandered around, and took some tourist photos which I share here. 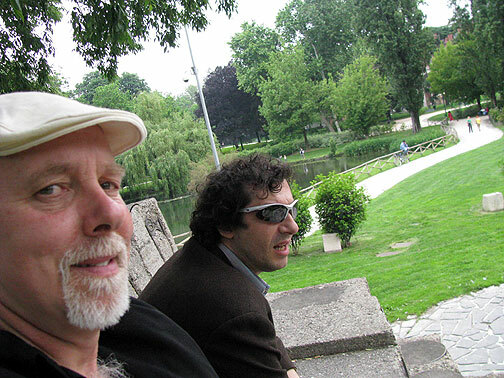 Giovanni and I walked and laughed and discussed for hours, much to our mutual delight. 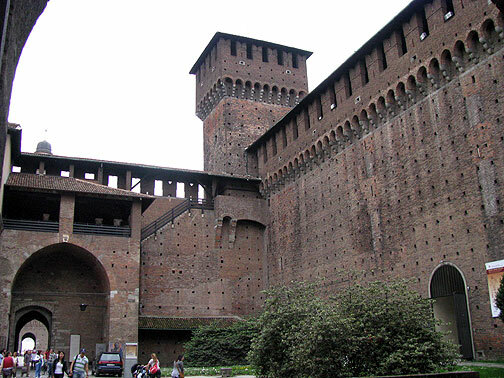 Part of the time we were in the big park surrounding Milan’s old castle. What is this odd statue? 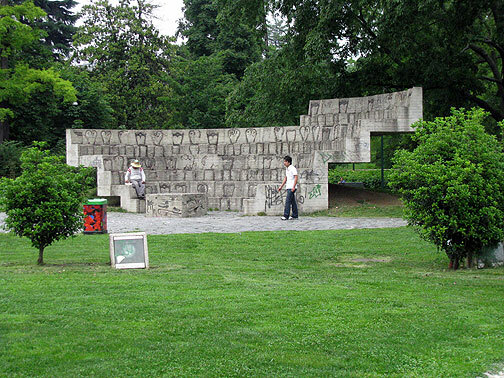 A monument to WWI soldiers? A premonition of flyer saucers arriving? We had to laugh, even while I kind of liked it”¦ a short distance away we found this tiny amphitheater in which metal chairs have been embedded. It’s apparently used most of the time for drumming circles, but we found it a good stopping point as our discussions continued unabated. 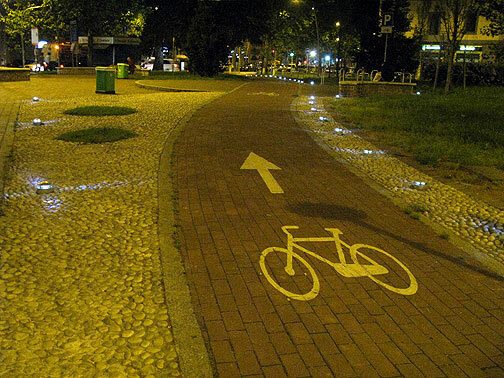 I’m always tracking bicycles and bike infrastructure. 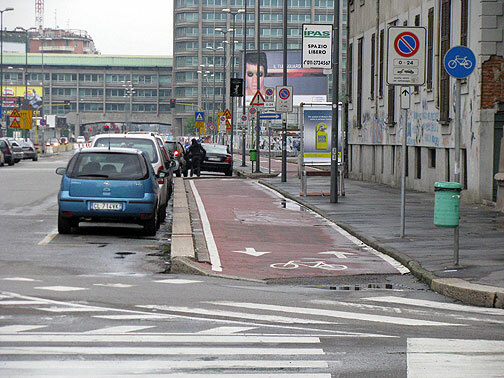 Lots of bicycles in Milan, even though it’s a very unfriendly urban landscape for bicycling. Not as many scooters or motorcycles as in Rome or Naples, but cars are everywhere, and take over sidewalks to double park in most neighborhoods I walked through. The metro is great, the surface trams and buses are also pretty wonderful compared to anything in the U.S. And there is a glimmer of hope that eventually Milan will accommodate bicycles in a more comprehensive manner. There is certainly an active bicycling subculture here, with four ciclofficina’s (“cycle offices” or DIY bikeshops), and a strong, regular Critical Mass. Here are a couple of shots of the minuscule bike lanes I came upon, neither going more than a fraction of a block, but at least being the kind of proper separated sidepath that I think is the key to a radical increase in urban cycling. 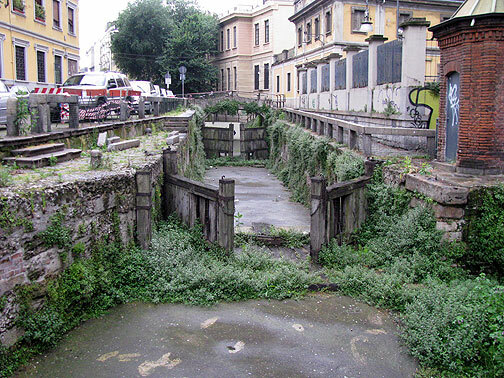 Not far from the outdoor bike lane photo is this lost corner of central Milan, where ancient locks still stand, apparently designed by Leonardo da Vinci, but straddling a canal that has been long buried beneath cement. It’s a great spot for parties according to Giovanni. We also visited the main art museum, which is chock full of the same repetitive catholic paintings, bleeding saints and crucified christs. It was relentless. But every so often one would discover something quite different, something rather prosaic and human. Then I’d just light up. 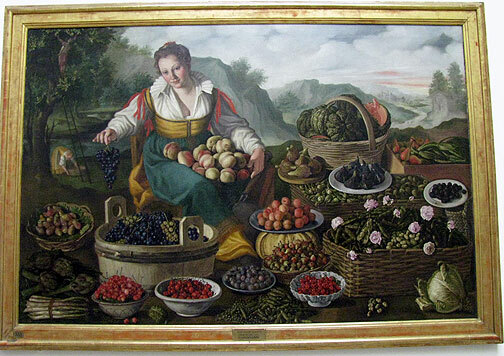 Here’s one of my favorites, which reminded me of an article I read a while ago, I think it was in the New Yorker, about a botanical investigator who uses old paintings to track down remnant orchards and lost strains of various cultivated edible foods. The building itself is beautiful, both an art school and a museum. 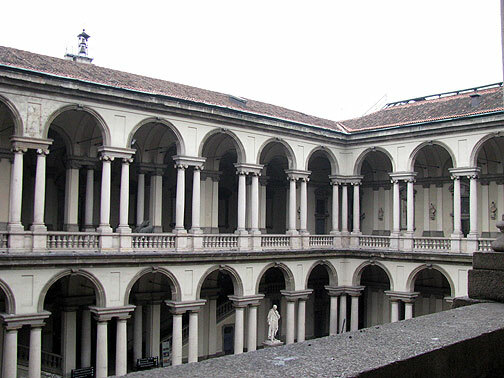 This is the courtyard, pretty typical of a lot of Italian buildings built in centuries past. 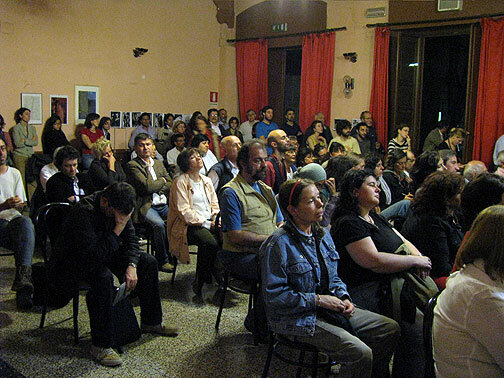 I’m sure it’s great that 150 people show up for a mass meeting to discuss the issues, given the rightward shift of Italian politics, the rising tide of scapegoating against immigrants here (a mini-riot between police and Chinese happened some time ago, I heard). But the Italian style, which is also the leftist style, of talking AT people rather than people talking WITH each other, assures a repeat of tired dynamics that don’t really change much. I’m writing these last words from Rome, where I arrived yesterday afternoon, and already have had an amazing visit. My host Paolo took me off to a bicycle picnic late last night, and it was such a thrill to be blasting through the streets of Rome on a very comfy one-speed with coaster brakes. Once again, like Manhattan, bicycling in this chaos is somehow liberating and definitely exhilarating! Much more to come from Rome!